The Steelie Car Mount is made by Nite Ize Innovations and aims at giving you the best smartphone mounting experience while driving. This mount started off as a Kickstarter project and got successfully funded by raising over $33,000 in just a few weeks. The Steelie is another car mount that uses the power of magnets to mount your phone in the car. We've reviewed the magnetic Wallee M before but this one is different. It works with almost any smartphone or smartphone case. 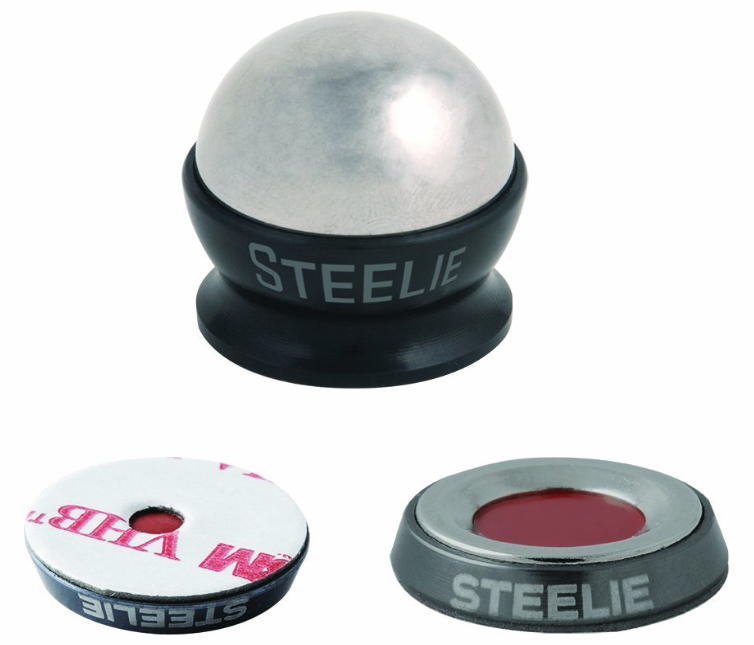 Design: There are two components to the Steelie mounting solution. 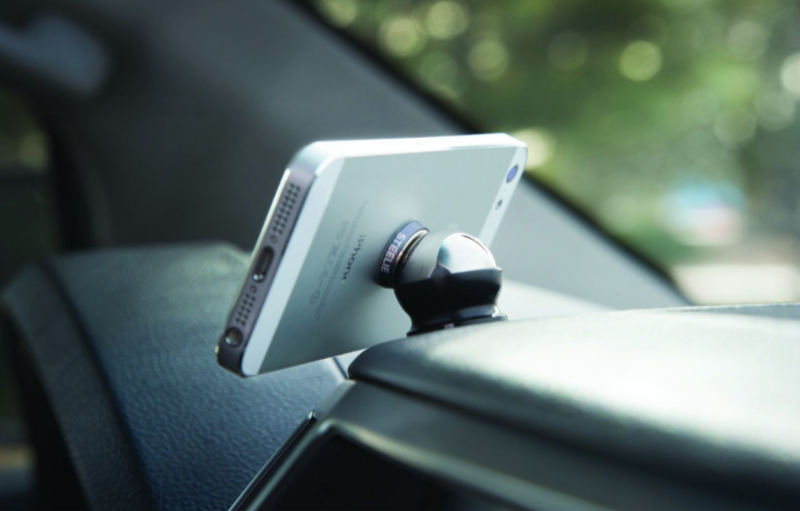 A small, quarter-sized (1 quarter in diameter, 3 quarter thickness) magnetic phone socket component that sticks to the back of your phone or phone case, and a ball mount component that will attach to your car's dashboard. The phone socket has a powerful circular magnet in it which securely attaches to the ball mount. The half-dome shaped ball mount gives you a wide range of viewing angles. How to mount: Both components of the Steelie Car Mount feature the 3M VHB Foam Adhesive tape for attachment. This adhesive is known for being very easy to remove when not needed, and comes off without leaving any residue. Clean all surfaces (back of your phone/case and the dashboard spot) with the enclosed alcohol pad and allow it to dry for a few minutes. Do not use any other cleaning agents. To properly mount your phone you have to find the center spot on its back to attach the phone socket component. It is important to get as close to the exact center as possible (I will explain why later). When you've found the best spot, just peel off the tape and attach it to the back of your phone or case by firmly pressing down on the socket. Give it about an hour for the best adhesion. The ball mount component attaches to your car dashboard. Find a good spot on the dashboard that will give you clear visibility of your phone from the driver's seat. Make sure the dashboard surface has been cleaned and is devoid of any polish or dirt. This will ensure the mount attaches securely. Allow 24 hours for the adhesion to be optimal before mounting your phone. Once both components are attached, you can mount your phone and find the best angle by just rotating it while mounted. Note: For mounting on softer textured surfaces like a vinyl car dash or rubber, use the enclosed 3M Primer to the surface. Squeeze the 3M Primer stick at the dot to wet the felt tip. Rub the primer only on to the immediate area where the mount will be placed and allow it to dry for 5 minutes. How to remove: To remove the Steelie Mount components you will need a few drops of rubbing alcohol which have to be applied between the Steelie component and the surface or device it has been attached to. With a fishing line or dental floss, use sawing motion to cut foam away from the surface. Using your thumb or finger, roll remaining adhesive away from the applied surface. Complete installation and removal instructions can be found here. The good: The Steelie Car Mount is minimalistic, which I love. The phone socket component sticks out a little but has a few advantages. The presence of a powerful magnet in it gives you the additional functionality of mounting it on other metallic surfaces like a refrigerator, filing cabinet etc. Also, I found the socket to give me extra grip when holding my phone. The magnet is strong and keeps the phone in place when mounted. The ball mount component is not very large either. It's noticeable on the dashboard but is in no ways a monstrosity. Steelie Car Mount works with any smartphone you would use in your car like an iPhone, Android, Windows or any other. It also works with almost any smartphone case where the adhesive tape can be attached to. There are a couple of other Steelie system components it can work with in addition to the car mount. The Steelie Pedestal can be used to mount your device on a table (more useful when using with a tablet device) for good viewing angles while watching a video or even typing. The Steelie HobKnob is a knob-like appendage that attaches magnetically, giving you a handle and/or a stand on your device. The bad: Just of a couple of things that I read about but actually didn't encounter. In a couple of customer reviews on Amazon, users complained of the phone sagging on one side when mounted. Here's where finding the center of the back of your phone comes in. If you attach the phone socket to the centermost spot you won't have this problem. Some users also complained of the phone tilting when attaching a cable to it. If your cable has enough length to give you shouldn't have any issues here. The phone socket component has to remain on your device at all times. Even though I didn't found it to be an issue, some of you may find it obtrusive. 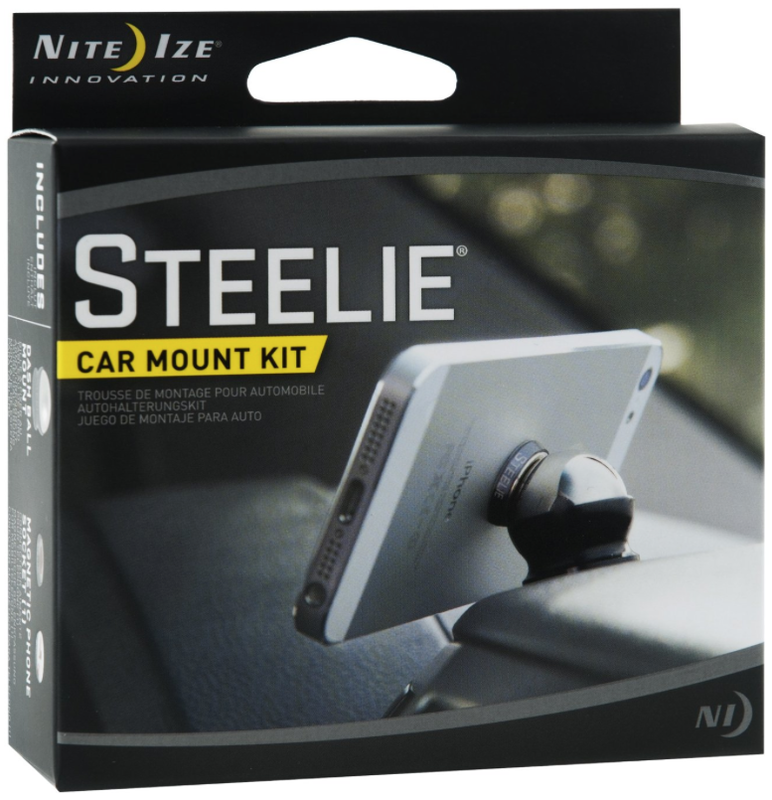 Price and Where to buy: The Steelie Car Mount Kit retails at $34.99 (plus tax and shipping) if purchased directly from Nite Ize. We have found a much cheaper alternative though. I will post pictures of the Steelie Car Mount being used in my car soon. So keep an eye out for that.